IMAGE FROM THE POSITRON EMISSION TOMOGRAPHY DEPICTS GLUCOSE METABOLISM IN THE BRAIN OF AN ALZHEIMER'S DISEASE PATIENT. 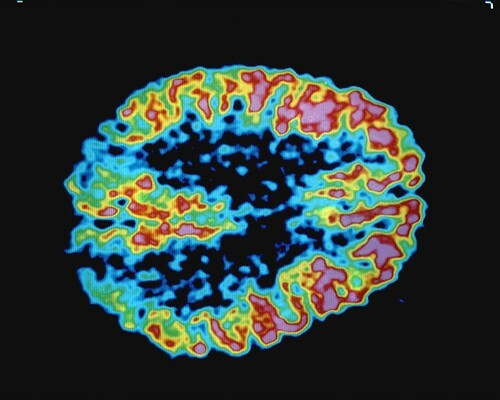 IN THIS COLOR IMAGE, PRODUCED AT LBL'S DONNOR LABORATORY 600-CRYSTAL POSITRON EMISSION TOMOGRAPH (PET), GLUCOSE METABOLISM IN THE BRAIN OF AN ALZHEIMER'S DISEASE PATIENT IS ILLUSTRATED. RED INDICATES THE HIGHEST DEGREE OF ACTIVITY, BLUE THE LOWEST. THE TOMOGRAPH HAS A RESOLUTION TWICE AS PRECISE AS ANY OTHER IN THE WORLD. IN PET IMAGING, A POSITRON EMITTING RADIOACTIVE TRACER IS INJECTED, INHALED, OR INGESTED BY A PATIENT OR SUBJECT, ALLOWED TO CONCENTRATE IN A PARTICULAR ORGAN OR TYPE OF TISSUE, AND IS THEN DETECTED BY A RING OF CRYSTALS PLACED AROUND THE SUBJECT. THE CRYSTALS DETECT PHOTON PAIRS CREATED WHEN POSITRONS FROM THE TRACER ENCOUNTER ELECTRONS AND ANNIHILATE. THE PHOTONS TRAVEL IN OPPOSITE DIRECTIONS, AND FROM THIS INFORMATION, SCIENTISTS CAN RECONSTRUCT AN IMAGE IN THREE DIMENSIONS - AND EVEN FOLLOW THE COURSE OF GLUCOSE UPTAKE IN THE BRAIN. For more information or additional images, please contact 202-586-5251.